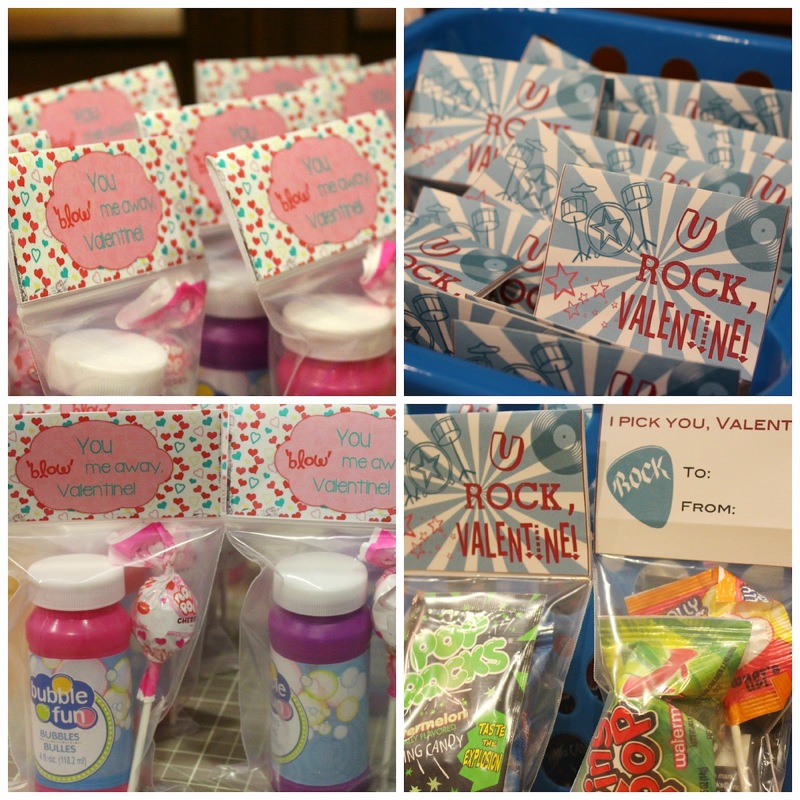 Today I am sharing with you Bryce and Madison’s Valentine’s Day treat bags! Both of them have class parties on Thursday and we are all set and ready to GO!!! Below I am going to show you step by step instructions on how to make and where you can get supplies, and for an inexpensive price. To start off, I am going to show you Madison’s! In her special needs preschool class there is only 9, including her, and I choose something age appropriate…BUBBLES! First I downloaded the printable with the tags already made up, all you have to do is print and cut. Easy right!? Here is the link to “Blow Me Away” Valentine’s topper. For the supplies you will need bubbles, blow-pop, clear plastic zip-top bag and double sided tape. The bubbles I purchased at The Dollar Tree, 3 for a $1.00! The bags you can purchase online through Amazon like I did, or your local craft store. Blow-Pops are easy to find, I purchased mine at Walmart, 24 for $2.49. I already had the tape and white cardstock to print the toppers. Now you want to cute the cards out, you get 4 per sheet. Fold in half and use a bone folder to get a nice straight edge. Now fill your bag with 1 bubble, 1 lollipop, and zip close! Next you put your double sided tape in the inside ends on both sides. Then place evenly on both sides of the bag about a 1/4 to 1/2 inch down. Easy…inexpensive and age appropriate for a 4 year old class!!! Now for the Brycee-Boy’s Valentine’s Day Treat Bag! The supplies I am using are a bone folder, double-sided tape, paper trimmer and craft mat. Here’s the link to “U Rock” treat bag topper! These are the fun play on words candies we added, Pop-Rocks, Ring Pop (a rock!) and Bryce wanted to add a Jolly Rancher heart shaped lollipop. Pop Rocks and Ring Pops were at The Dollar Tree. Pop-Rocks 3 for $1.00 and Ring Pops 4 for $1.00…can’t beat that!!! Once you stuffed the bags, making sure the Pop-Rocks faces front, tape the inside ends on both sides and place on top of bags. Here’s a side view of how far I placed the topper down! There you go, now we did this X’s 20! I think they came out great, super cute and inexpensive…just what I wanted!!! Here’s Bryce hard at work stuffing all 20 of his Valentine’s! I hope you found this helpful and you liked the way they turned out as much as we did!! !